Feds Charge SAC Capital In Insider Trading Case : The Two-Way But billionaire hedge fund owner Steven Cohen was not hit with criminal charges. SAC is charged with one count of wire fraud and four counts of securities fraud in connection with alleged insider trading by "numerous employees." 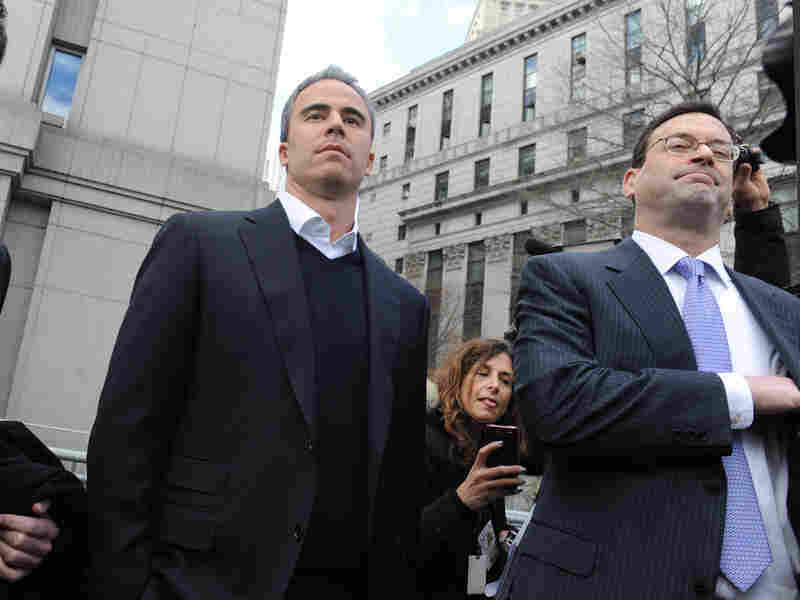 Former SAC portfolio manager Michael Steinberg (center) exits a Manhattan federal court with his attorney after his indictment on securities fraud charges in March. Federal officials in New York City have charged SAC Capital Advisors with insider trading, the culmination of a protracted investigation into the hedge fund founded by embattled billionaire Steven Cohen. SAC is charged with one count of wire fraud and four counts of securities fraud in connection with alleged insider trading by "numerous employees" at "various times between in or about 1999 through at least in or about 2010," according to the indictment. According to NPR's Yuki Noguchi, "The Department of Justice's 41-page indictment details a culture at SAC that it says encouraged trading based on inside information. At its peak, the firm controlled $15 billion in assets, and for more than a decade, prosecutors say, SAC employees solicited nonpublic information and used it to trade stock in publicly traded companies." The charges come less than a week after the Securities and Exchange Commission filed civil charges against Cohen, accusing him of failing to prevent insider trading at the firm. The New York Times' Dealbook writes that the charges filed Thursday are underpinned by "the theory of corporate criminal liability, which allows the government to attribute certain criminal acts of employees to a company itself." Going after SAC could devastate the Stamford, Conn.-based hedge fund "because the banks that trade with the hedge fund and finance its operations could abandon it," it says. Bloomberg, citing a person familiar with the matter, writes: "Deutsche Bank AG (DBK) and Goldman Sachs Group Inc. (GS) are among firms weighing the reputational and financial consequences of continuing to provide trading, lending and prime brokerage services to SAC, one of Wall Street's largest trading clients." The fund, which employs about 1,000 people globally, issued a memo to employees on Wednesday after a grand jury voted to go ahead with the charges saying the firm "will operate normally and we have every expectation that will be the case going forward." Dealbook describes the latest indictment as part of "an unrelenting crackdown against insider trading" by federal authorities, saying that while Cohen may escape being criminally charged, he is "inextricably tied" to SAC and: "Not only are his initials on the door, but Mr. Cohen also owns 100 percent of the firm he founded in 1992."